A SpaceX Dragon spacecraft approaches to be captured by the International Space Station's robotic arm, Canadarm-2. More than 2,000 are expected to head to Houston this week for SpaceCom 2017, the third annual Space Commerce Conference and Exposition. The conference will bring commercial spaceflight leaders and innovators together from Dec. 5 to Dec. 7 to explore how spaceflight technology can drive industry back on the ground and how commercial spaceflight ventures can grow. SpaceCom will include talks by Peggy Whitson, recently returned from her record-breaking stay on the International Space Station; Robert Lightfoot, NASA's acting administrator; as well as keynote talks from representatives of the Italian Space Agency, United Launch Alliance, Inmarsat, Digital Globe, IBM Watson and more. The full list of speakers is extensive. "The aerospace industry remains the focal point for SpaceCom, with an emphasis on fostering new public-private partnerships and exploring ways to engage directly with NASA, international space agencies and commercial space entrepreneurs," SpaceCom representatives said in a statement. 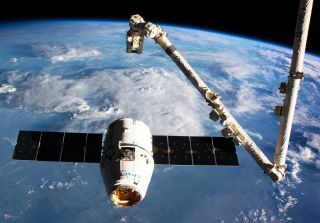 "In addition, SpaceCom addresses opportunities for terrestrial industries such as agribusiness, energy and maritime to achieve valuable efficiencies through space-enabled Earth observation and satellite services." "The conference will also shine a spotlight on revolutionary new developmental and research opportunities in space that are now available to the medical and advanced manufacturing fields," they added. Besides the talks, attendees will visit a show floor with exhibitors including NASA, United Launch Alliance, Orbital ATK, Boeing and Lockheed, as well as astronauts available for book signings and discussion, the conference's executive director, James Causey, told Space.com earlier this year. A daylong entrepreneur workshop will also let companies pitch to venture capitalists and angel investors. This conference comes at an exciting time for commercial spaceflight, with the first crewed commercial launches scheduled for the near future. SpaceX is preparing for the first test launch of its Falcon Heavy in the next few months, and Boeing's CST-100 Starliner spacecraft is aiming for an uncrewed test launch next year. Both companies have contracted with NASA to transport astronauts to the International Space Station, although SpaceX is already discussing phasing out that future rocket for a BFR megarocket. Companies including Virgin Galactic and Blue Origin continue to push forward future space tourism projects, and SpaceX has even announced a loop around the moon for two paying passengers. In addition, initiatives like Google Lunar X Prize are encouraging privately funded groups to go to space — that competition, whose deadline is currently March 2018, is offering $20 million to the first of five finalist teams to land a spacecraft on the moon, move a specific distance and send back photos and video. Space.com's Sarah Lewin (@SarahExplains) will be on the scene at SpaceCom to report on announcements and discussions as they develop.